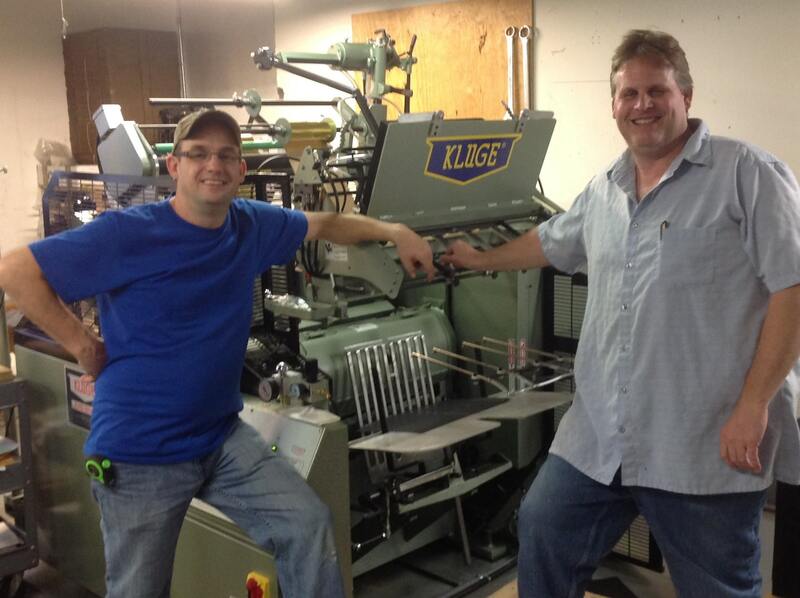 Madison Bindery, Madison, WI, has installed a Kluge 22×30 EHG Foil Stamping, Embossing and Diecutting Press. The EHG will allow them to better serve their customers by bringing the 30″ market in-house. The 22×30 EHG complements their two 14×22 EHD presses providing a larger platen and more than 2.5 times the impressional strength. Building on Kluge’s long history of quality, durability, and strength; the EHG is a popular choice for Kluge users that want to upgrade to a larger size press with the added convenience, time and cost savings of an electronic foil control system and the adjustable impression feature. For 27 years, Madison Bindery has served southern Wisconsin with high quality diecutting, perfing, embossing and foil stamping. Co-owners Scott Staples and Jon Friske partnered in 1995 bringing their talents and vision to Madison Bindery. Incorporating hard work and good business decisions over the years, Madison Bindery is proud to have built a loyal customer base by consistently meeting their customers’ expectations one job to the next. “We were looking at getting into the larger format diecutting and the market was right to make the move now. The EHG has many advantages – the ability to run jobs multiple up is good and the adjustable impression feature makes make-ready easy and it saves time. Being a diecutter, what I like most about Kluge is the registration. Kluge has the best registration on the market. It can hold it perfect. I’d recommend any shop to go with Kluges,” said Scott Staples. Scott Staples began his career as a Kluge operator and has been active in the industry for more than 30 years. Scott Staples (left) and Jon Friske (right), Co-Owners of Madison Bindery, stand next to their new Kluge EHG.